Triathletes walk a fine line between training well and being in great health, and toppling over the abyss of injury, then limping around and bemoaning the fact to all and sundry. If you’re an elite triathlete, there’s a 75% chance you’ll be injured within any given five-year period, according to a 1988 study published in the International Journal of Sports Medicine. And if you’re a club level triathlete, you’re not off the hook either—you have a 56% chance of being injured in the same time period. Half of all triathletes have been injured at some time in their career. Regardless of their level, many competitive triathletes find out the hard way that everyone has a training threshold with a point of diminishing returns—a biological or biomechanical point where any additional training will produce a decrease in performance, and lead to injury. Clearly, triathlete injuries are part of the multi-sport event, but the good news is that most triathlete injuries can actually be predicted from a series of warning signs, and treated immediately, with a fast recovery. With some education, your chances of injury are significantly reduced and you will not have wasted all those months of conditioning. If you notice any of the following, you’re on the injury train, so be prepared to slow down and stop running, cycling or swimming. Reduced range of motion about the joint, compared with the other side, usually indicates injury. Nearly all triathlete injuries have some swelling, especially around the joint or on a muscle. While checking for swelling (by comparing the affected area with the non-affected area), feel for heat on the area. These symptoms, plus redness are indicators of injury. If the affected muscle does not generate as much force as its opposing counterpart, weakness is usually an indicator of injury. This can be difficult to measure, but if you put a weight on one leg and cannot lift the same weight as easily with the other, or if it feels painful when contracting, you have an injury. If you need to take anti-inflammatory or painkilling medications such as aspirin, ibuprofen, Tylenol, etc. Studies show that running is the major cause of triathlete injuries (70%) because of the high impact involved. In fact running causes more injuries than cycling and swimming combined. Research done on the training habits of triathletes is revealing. One paper done on Ironman triathletes found that their cycling training comprises an average of 350km per week, spread over 4-5 days; running comprises 72km per week, spread over 4-6 days. Thus the average triathlete does more high impact running than he does low impact cycling. Research shows the best predictors of running injury are high weekly mileage, training consecutively for several days, and having a history of previous injuries. And half of all injuries can be traced back to a previous injury in the same area. One study concluded that the average runner could expect to be injured once every 150-200 hours of running. Given the rigorous multi-sport nature of the triathlon, it is fair to say that triathletes can expect to be injured at least as frequently. In running, the surface you run on contributes to injuries, especially uneven surfaces, slanted or curved roads, and hard surfaces like concrete or tarsal roads. Improper shoe choice is another prime cause of running injuries. i.e. running in shoes made for other sports, or failing to change your running shoes frequently. Other running injuries are caused by trauma such as tripping, falling or twisting your ankle, overstretching, and running too fast without adequate warm up. Poor running biomechanics, combined with any of the above is often enough to cause injury. Most injuries can be tracked to one cause or a combination of causes such as overtraining (aka training error), poor flexibility, or low strength. The list of culprits is endless, from doing too much too soon, and too often, to running or cycling too fast, too hard, with too little rest between workouts. A study done by Shaw et al on 258 non-elite triathletes found there is a direct relationship between hours spent training and incidence of injury. These researchers found a U-shaped association, where triathletes training at high levels and low levels were at higher risk for injury. Those training between 8-10 hours each week, cycling for 5-6 hours and running 3-4 hours each week, had the lowest incidence of injury. A sharp stab or deep aching underneath your foot, from the heel to the arch. It will hurt a lot first thing in the morning when you walk around, or after you’ve been sitting for a long time. Pain on the outside of the knee or when you bend it at a 45-degree angle, or at the hip. Usually on the outer thing area. Tenderness behind or around the patella, usually around the centre of the kneecap. Pain increases when sitting with knees bent for a long time, or when climbing stairs or running uphill. Tenderness, soreness, or pain along the inside of your calf region, beside the shin. This can also be a dull, deep, aching, and usually happens only when you’re running. Dull or sharp pain anywhere along your Achilles tendon, but usually close to the heel. You’ll usually feel pain when squeezing the Achilles tendon in the affected area, and may sometime feel lumps or nodules along the tendon. Cycling injuries tend to be in the knee, lower back and neck, resulting from the repetitive motion of cycling. Triathletes experience chronic sprains of the ligaments that support the knees, and back pain is frequently encountered from hunching over on the bike. This is usually countered by changing the seat position or the handle bar reach. The use of aerodynamic handlebars has caused a whole new syndrome, called ‘aeroneck’, from sitting for long periods with the shoulders hunched and the head hyperextended forward. This syndrome manifests itself as a painful, stiff neck, and the best we can do to address this is by adjusting our seat forward and widening the elbow pads. Swimmers tend to suffer much less afflictions than runners and cyclists. The main injury from swimming is swimmer’s shoulder (supraspinatus tendonitis), where the supraspinatus tendon rubs against the tip of the acromion process from the repetitive rotation of the arm (about 1500 times in a 3000meter swim). This responds well to stretching, icing after the workout, and avoiding hand paddles until the inflammation has settled down. Should We Keep Exercising While Injured? One of the major problems we encounter with triathlete injuries is that if our legs are injured through running, cycling may exacerbate it, and vice-versa. And that’s the problem—should we keep exercising on the affected area? This is largely a matter of common sense and trial and error. If you’ve crocked your Achilles tendon, for example, then putting any resistance on it is likely to aggravate it. However, there are always alternatives. You could try deep-water running as this does not stress it at all, and still gives your cardiovascular system a good workout. What Level of Pain is okay for Triathletes? Often it’s hard to discern between the general muscle soreness experienced after a workout, and the beginnings of an injury. If the discomfort dissipates a day or so after your training session, or disappears after 10 minutes of exercise, it’s fine to train. Some injuries become evident immediately, while others creep up slowly on you, getting progressively worse over days, weeks, or even months. Pay attention to both types. 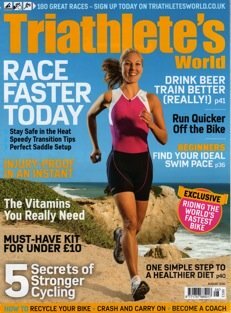 This article is intended to be a review of the most common symptoms of impending injury, and an overview of the most common triathlete injuries. Now that you know what to look for when training and racing, be ever vigilant for these symptoms, and be prepared to take immediate action to address any aches and pains you feel. If you take immediate action, you won’t have nearly as much time off your training compared with if you just leave the injury to heal itself.